Hot and versatile superstar Usher led the entire field of 19th Annual (2005) Soul Train Music Awards nominees, with a total of five nominations, it was announced today, by rapper, songwriter, comedian and film star – Nick Cannon, during a press briefing at Spago, Beverly Hills. Usher has completely dominated the music industry in 2004 at both radio and retail, maintaining his grip at the top of the charts with his blockbuster release – Confessions, featuring the hot, multi-format singles “Confessions Part II” and “My Boo.” Usher has proven himself to be a major internationally recognized star and musical innovator, who continues to push the boundaries of art and commerce. Usher’s five 2005 Soul Train Music Awards nominations are for Best R&B/Soul Single, Male (“Confessions Part II”), Best R&B/Soul Album, Male (“Confessions”), R&B/Soul Single, Group, Band or Duo (“My Boo” featuring Alicia Keys), The Michael Jackson Award For Best R&B/Soul or Rap Music Video (“Yeah!” featuring Ludacris & Lil Jon), and Best R&B/Soul or Rap Dance Cut (“Yeah!” featuring Ludacris and Lil Jon). Sultry LaFace Records recording star Ciara, widely renowned as “The Princess of Crunk,” pulled in an equally exciting four 19th Annual Soul Train Music Awards nominations. Ciara earned nods for Best R&B/Soul Album, Female (“Goodies”), Best R&B/Soul Single, Female (“Goodies” featuring Petey Pablo), Best R&B/Soul or Rap New Artist (“Goodies,” featuring Petey Pablo), and Best R&B/Soul or Rap Dance Cut (“Goodies” featuring Petey Pablo). Ciara was closely followed by J Records recording superstar Alicia Keys, who earned three 19th Annual Soul Train Music Awards nominations for Best R&B/Soul Single, Female (“If I Ain’t Got You”), Best R&B/Soul Album, Female (“The Diary of Alicia Keys") and Best R&B/Soul Single, Group, Band or Duo (“My Boo”) with Usher. Five recording artists earned two nominations each, including Beyoncé, Destiny’s Child, Jill Scott, New Edition and Prince. Beyoncé earned noms for Best R&B/Soul Single, Female (“Naughty Girl”) and Best R&B/Soul Single, Group, Band or Duo ("The Closer I Get To You”). Destiny’s Child was recognized for Best R&B/Soul Single, Group, Band or Duo, (“Lose My Breath”) and Best R&B/Soul Album, Group, Band or Duo (“Destiny Fulfilled”). Jill Scott earned attention for Best R&B/Soul Single, Female (“Golden”) and Best R&B/Soul Album, Female (“Beautifully Human: Words and Sounds Vol. 2”), while New Edition got noticed for Best R&B/Soul Single, Group, Band or Duo (“Hot 2Nite”) and (“Best R&B/Soul Album, Group, Band or Duo, “One Love”), and Prince copped nominations for Best R&B/Soul Single Male (“Call My Name”) and Best R&B/Soul Album, Male (“Musicology”). In addition, 20 other recording artists earned one nomination each. The 19th Annual Soul Train Music Awards will be videotaped on Monday, February 28 at Paramount Studios and will be broadcast in first run, national syndication on March 12 via Tribune Entertainment Company Distribution. 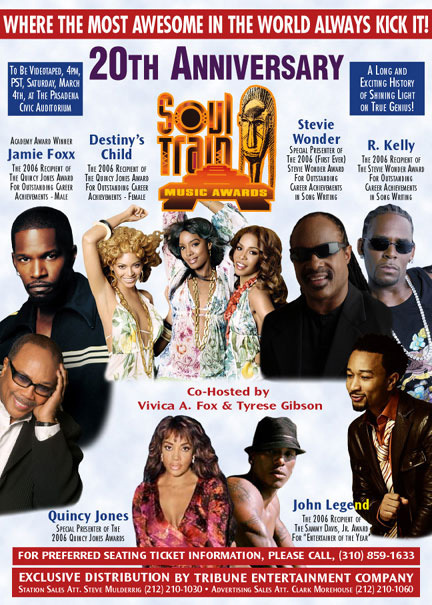 An extraordinary quartet of superstar performers will serve as co-hosts of the 2005 Soul Train Music Awards including tall and talented Motown Records’ superstar Brian McKnight, 2004 American Idol Champion Fantasia Barrino, versatile film and hip-hop music star Nick Cannon, and “The Simple Life” co-star Nicole Richie. The 2005 Sammy Davis, Jr. “Entertainer of the Year Award” (Male & Female): Usher and Ciara, respectively, while the Soul Train Music Awards’ highest honor, The Quincy Jones Award for Outstanding Career Achievements will be presented to hip-hop/rap superstar and gifted film actor/writer/director Ice Cube. The long established, overall, Soul Train Music Awards voting body includes active professionals in the fields of radio station programming, retail sales and management and recording artists with records that reach one or more music trade publication charts during the past one year eligibility period.